Random House Trade Paperbacks, 9780812966763, 320pp. A pioneering look at first marriages lasting five years or less and ending without children, Paul’s book “will be a lesson to those contemplating marriage and a comfort to those who falter” (The Economist). What is it about marriage that makes today’s twenty- and thirtysomethings want it so badly? And why do so many of their marriages, despite high hopes and desires, end in divorce? Nobody goes into a starter marriage expecting to divorce and trade up to something better, but like a starter home, a starter marriage can teach you a lot about what to look for, and what to avoid, the next time around. 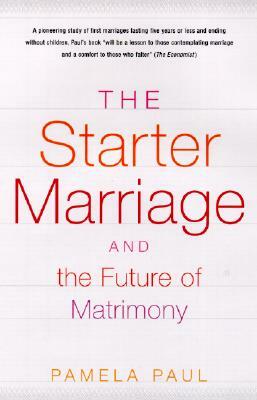 Drawing on extensive research and interviews with starter-marriage vets, Pamela Paul explores why young people are jumping in and out of marriage, and what lessons can be drawn from their failures. She shows how starter marriages can be avoided, and why lifelong marriage is still a desirable, achievable option for the next marrying generation. Pamela Paul is currently an editor at American Demographics magazine, where she reports on social, political, and media trends. She is also a frequent New York correspondent for The Economist. In addition, her work has appeared in magazines such as Elle, Redbook, and Time Out New York. Her own starter marriage ended in 1999.